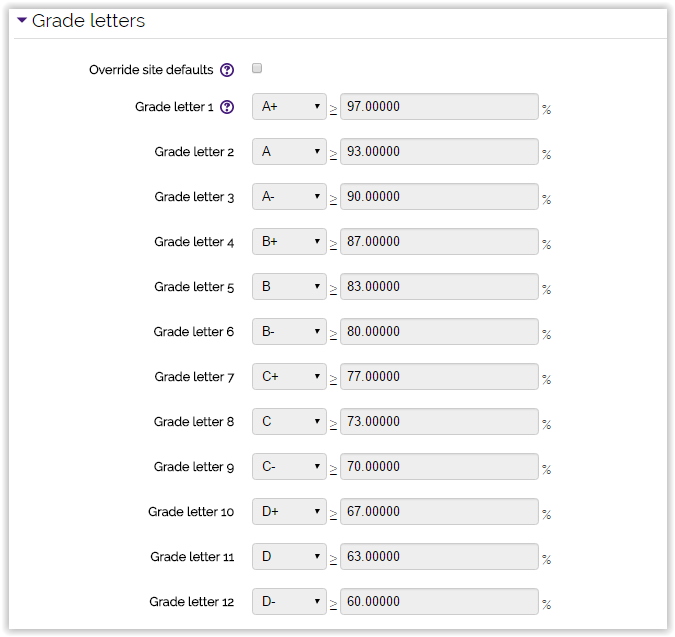 Moodle 3: How to Create Custom Grade Scales (Letter Grade)? *NOTE: Beginning the Fall 2015 semester, plus/minus grading is required for all undergraduate, graduate, and professional courses using the A+ through F letter grading system. The default scale in Moodle will be a “sample” grading scale in which instructors can adjust to meet their own needs. 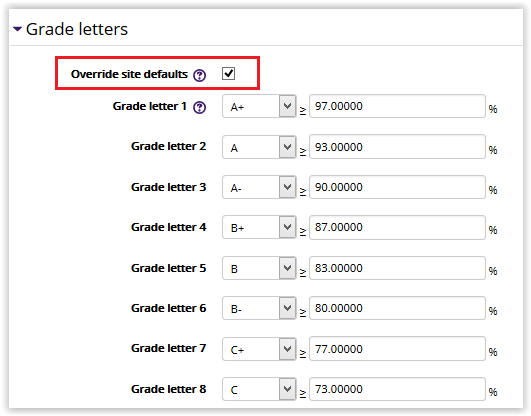 If the plus and minus scale does not show up, or if you do not see enough spaces for all the letter grade boundaries for the plus/minus scale, please uncheck the "OVERRIDE SITE DEFAULT" and follow the instructions below to change the default values of each grade scale boundary. Click on "SAve CHANGES" when finished. For additional information regarding the plus/minus grades guidelines, please visit the Office of the University Registrar website. 2. Click on the 'Grades' link in the Administration block. 3. Click on the drop-down menu in the top middle of the gradebook page. Under the Letters section, click on the Edit link. 4. 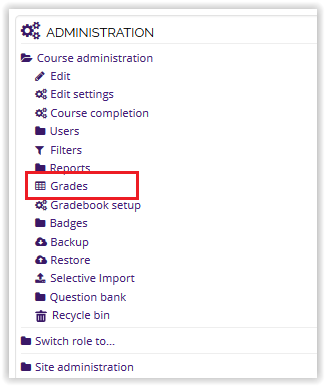 The default values for the letter grades are set when your Moodle course is created, but you can edit them by clicking on the Override site defaults box. Until the override is selected, the text fields for each grade boundary are locked and greyed-out. 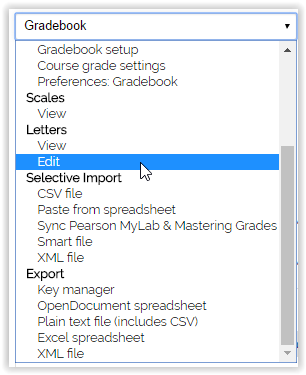 Note:If the plus and minus scale does not show up, or if you do not see enough spaces for all the letter grade boundaries for the plus/minus scale, please uncheck the "Override site defaults" checkbox and follow the instructions below to change the default values of each grade scale boundary. Click on "Save Changes" when finished. 5. Once the override is enabled, the text fields beneath each letter grade will become open for you to type new boundary values. Type the number for the lowest possible value for each grade. Moodle rounds only after the 4th decimal, so a lower boundary of 90.0000 for an A will determine that a grade of 89.9999 is a B. 6. After making changes to the letter grade boundaries, click on the 'Save Changes' button.